Classic Garden Elements has made its name producing classic modern outdoor and garden architecture. Our German-based, family business has adopted as its symbol the Etruscan pine cone, inspired by the 2000-year-old giant bronze cone now located in a courtyard in the Vatican. The cone topped our very first two garden obelisks, immediately attracting the attention of garden professionals at international fairs. In 2002, Classic Garden Elements made its first appearance at the Chelsea Flower Show when a leading nursery, Peter Beales Roses, used our structures to decorate its entire stand. Today, our simply-named “Obelisk I” and “Obelisk II” are still among the bestselling garden obelisks in Europe, the USA and Japan. 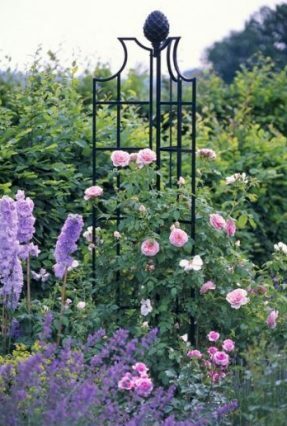 In the meantime, we have added over 80 English-inspired trellises to our range of top-quality products, all of which are manufactured at our factory in Slovakia. 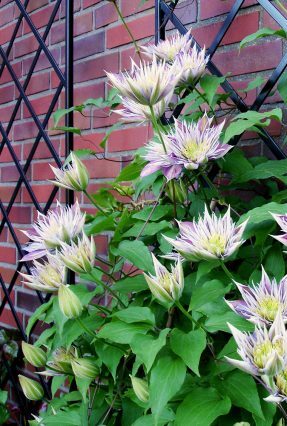 Many Classic Garden plant supports have been inspired by traditional trellises discovered both in historical gardens and parks and in antique garden books. 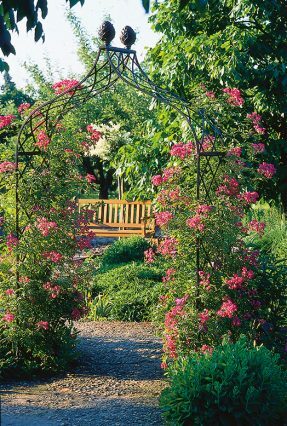 This lends them an air of romance and nostalgia, making them beautiful focal points in contemporary gardens. At Classic Garden Elements we strive to combine aesthetic appeal with practical functionality. In developing our products over the years, we have drawn on valuable suggestions from our customers as well as on the experience of long-term cooperation with leading European rose nurseries. Our products are at once decorative and extremely stable and sturdy. 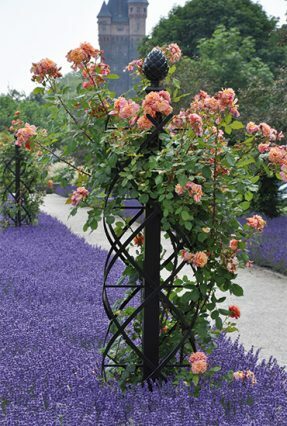 “Everything for the rose, the queen of flowers.” Classic Garden Elements fulfils its philosophy by offering a wide range of imposing three-dimensional trellises, including columns, pillars, garden obelisks, pyramids, arches, arbours, pergolas and gazebos. We also produce fine, elegant trellises, including perspective French-designed trompe-l’œil structures. All trellises are made of welded heavy-gauge steel bands and steel pipes, hot-dip galvanized and powder coated. Classic Garden Elements come with a full ten-year guarantee against weather-related rust. Romance. Style. Hype. Elegance. Uniqueness.